Existing home sales are up: Rah! Rah! Rah! 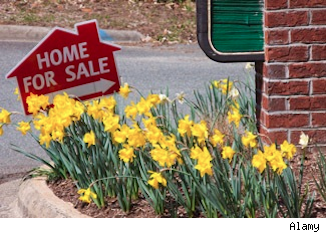 You're probably hearing the resounding cheers as the National Association of Realtors reported Thursday that sales of existing homes rose to a three-year high in February. Even more exciting is that real estate inventory, which has been frustratingly low for quite a while, increased 9.6 percent in February as well. Now we're not saying that any of this isn't good news. We're just saying, temper your enthusiasm. • While consumer confidencein the economy is growing, homeowners aren't necessarily selling. Forty percent of consumers are still not willing to put their homes on the market, while three quarters of ERA brokers and agents report seeing an increase in buyer interest. That means that the inventory crunch, though it loosened a bit in February, will continue. • It's still an active investor market. Corporate-backed purchases of distressed properties still run a large part of the market. There are individual investors, too, but competition from the big outfits is fierce. Still widely missing from the game? The first-time homebuyer. And without them, it's hard to see how sustainable the current housing recovery will be. • An increase in home equity will convince sellers of previously underwater properties to finally put their homes on the market -- but that's not happening yet. The hangover from a long, persistent period of decline in home values has made homeowners nervous to try their hand at selling again. Now is really the time those sellers should be in the market, but they'll likely need some more time before they're convinced to take the plunge. Another note about the increase in inventory in February that NAR reported: Jed Kolko, chief economist at Trulia, cautioned that "the typical seasonal pattern for inventory is to rise significantly between January and February." Though this one was a doozy -- the biggest monthly inventory increase since December 2010 -- it's not like this stuff never happens. But Kolko did say that it could be the first sign of some very good juju for homebuyers: It's "an early hint that the inventory crunch may finally be easing for good." Home prices in Norwich and New London have tumbled 23.4 percent since their Q2 2006 peak. It has a population of 273,502, an unemployment rate of 8.6 percent, and a median family income of $80,500, above the national median of $63,800. It also has a median home price of $225,000. Find homes for sale in Norwich and New London, Conn., or search listings in your area. Data provided by Fiserv Case-Shiller Indexes. Tucson's home prices have plunged 40.4 percent since their Q1 2006 peak. The metro has a median home price of $165,000. It has a population of 989,569, a median family income of $57,800, and an unemployment rate of 6.9 percent. Home prices in the Visalia and Porterville metro area have plunged 52.9 percent since they peaked in Q1 2006, and the city has a median home price of $145,000. It has a population of 449,253, an unemployment rate of 14.9 percent, and a median family income of $48,200 below the national median. Find homes for sale in Visalia and Porterville, Calif., or search listings in your area. Home prices in Ocala are down 48.1 percent from their Q3 2006 peak. The metro has a population of 332,529, an unemployment rate of 9.0 percent, a median family income of $45,300, and a median home price of $107,000. Find homes for sale in Ocala, Fla., or search listings in your area. Home prices in Yakima are down 9 percent since their Q1 2009 peak. It has a median home price of $157,000. Yakima has a population of 247,141, an unemployment rate of 9.3 percent, and a median family income of $48,800. Find homes for sale in Yakima, Wash., or search listings in your area. Home prices in the Gulfport and Biloxi metro areas have slipped 21.4 percent since their Q4 2007 peak, and the metro has a median home price of $108,000. It has a population of 253,511, an unemployment rate of 7.9 percent and a median household income of $53,100. Find homes for sale in Gulfport and Biloxi, Miss., or search listings in your area. The Vallejo and Fairfield metro area's home prices have fallen 59.2 percent since their Q1 2006 peak. It has a population of 416,471 and an unemployment rate of 9.5 percent. It also has a median family income of $76,800, and a median home price of $230,000. Find homes for sale in Vallejo and Fairfield, Calif., or search listings in your area. Home prices in Yuma have fallen 37.7 percent since their Q4 2006 peak. It has a population of 200,870, an unemployment rate of 30.1 percent, nearly four times the national average. It has a median family income of $45,700. Find homes for sale in Yuma, Ariz., or search listings in your area. The Reno and Sparks metro area has a population of 429,606, a median family income of $63,100, and an unemployment rate of 10.0 percent, higher than the national unemployment rate of 7.8 percent. Home prices are down 52.6 percent from their Q1 2006 peak, and the metro has a median home price of $177,000. Find homes for sale in Reno and Sparks, Nev., or search listings in your area. The Santa Barbara-Santa Maria-Goleta metro area has a population of 426,878, a median family income of $70,300, and an unemployment rate of 7.2 percent. Home prices are down 50.4 percent from their Q3 2005 peak, and the metro has a median home price of $285,000. Find homes for sale in Santa Barbara, Santa Maria and Goleta, Calif., or search listings in your area. Carson City home prices have fallen 51.0 percent since their Q2 2006 peak. The Carson City metro area has a population of 55,439, an unemployment rate of 10.2 percent, and a median family income of $66,300. Find homes for sale in Carson City, Nev., or search listings in your area. Sebastian and Vero Beach home prices have fallen 50.5 percent since their Q4 2005 peak. The metro has an unemployment rate of 9.9 percent, a median family income of $59,200, median home price of $139,000. Find homes for sale in Sebastian and Vero Beach, Fla., or search listings in your area. Home prices in the Panama City-Lynn Haven-Panama City Beach metro area have fallen 41.9 percent since their Q1 2006 peak. It now has a median home price of $143,000. The metro has a population of 169,856, an unemployment rate of 7.6 percent, and a median family income of $56,400. Find homes for sale in Panama City, Lynn Haven and Panama City Beach, Fla., or search listings in your area. Santa Fe's home prices have fallen 21.1 percent from their Q4 2007 peak. The Sante Fe metro area has a population of 145,648, an unemployment rate of 5.0 percent below the national average, and a median household income of $60,100, below the national median of $63,800. Find homes for sale in Santa Fe, N.M., or search listings in your area. Medford's home prices have fallen 39.2 percent since their peak in Q2 2006. The metro has a population of 204,822 and median family income of $50,100. At 10.0 percent Medford's unemployment rate is higher than the national average. Find homes for sale in Medford, Ore., or search listings in your area. More on AOL Real Estate: Find out how to calculate mortgage payments.